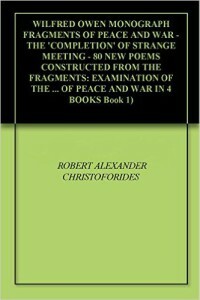 Robert Christoforides has produced five books regarding the life and works of Wilfred Owen. Those who have an interest in the 1st World War, Wilfred Owen and/or Poetry will find much of interest in the books. Robert Christoforides has spent over 24 years taking a serious interest in Wilfred Owen who was an English-Welsh poet and soldier and who became one of the leading poets of the First World War. This is an epic and monumental novel. It has no ‘agenda’ – its original, and always-unresolvable ‘quest’, was to ‘enquire’ into the creative process and its originations … in this case the poetic processes pursued by Wilfred Owen. It traces the life of this man from (before) birth to (after) death. But, notwithstanding, society, at the time, placed homosexuals at the extremist margins of society – they were utterly condemned and criminalised by society and the Law; although there was some current of general ‘toleration’, so long as the person concerned was neither seen nor heard of as blatantly homosexual. This book explores the hidden meanings behind the lines of 59 of Wilfred Owens’s poems.